Track review of "If You’ve Got the Money I’ve Got the Time"
As opposed to the ballad type of songs that Frizzell liked to write until then, the song was an up-tempo piece that foreshadowed the pure energy of country boogie that was related to rock 'n' roll. However, "If You've Got the Money I've Got the Time" was also a sophisticated tune that showcased Frizzell's superb way of phrasing lyrics. His characteristic way of punctuating, stretching and bending notes is on full display in a way that comes across as both intense and casually relaxed. He starts out regularly with "if you got the money," but then he takes the pronunciation of "time" on a rollercoaster. Then he drives across a bumpy road with his singing of "we'll go honk-eh tonk-in" before stretching out again with "we'll have a time." It's this elegant bending of the voice that makes Frizzell so interesting. Connoisseurs of jazz singing will find much to like in Frizzell's rhythmic treatment of a song that at the same time respects the atmosphere and emotion of the piece. In the case of "If You've Got the Money I've Got the Time," it's not a profound emotional statement, but rather an expression of freedom and freewheeling joy. "I was working in a nightclub in west Texas, in Big Spring to be exact, and then the juke box man came in. I was playing there every night...I had a friend that had come to visit me, him and his wife, that had played on my radio show when I was 18 in New Mexico. He was wanting me to go somewhere with him, and I said, 'Well, if you've got the money, I've got the time,' and it just hit me, that'd be a heck of a title for a song." The story tells a lot about the spontaneity of Frizzell's approach to writing songs. Ideas for songs came to him naturally and he understood how to pick them up. With "If You've Got the Money I've Got the Time" he created one of his signature songs. The song soared to number one on the charts and essentially built the foundation for Frizzell's career. It has since been named among the 100 greatest country songs of all time by the magazine Rolling Stone. Frizzell also returned to the song and later wrote a companion "If You Can Spare the Time, I Won't Miss the Money." 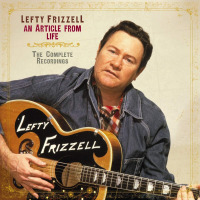 The complete story of Lefty Frizzell is told in a 20-CD tome released by Bear Family that includes every available recording and an audio book narrated by Frizzell's brother, David. There's also a huge 264 -page book in LP-format with a plethora of pictures and the definitive updated biography by Charles Wolfe. Bear Family has a long story with Lefty Frizzell. It started in 1984 when they released the first version of his complete works, His Life, His Works. That was in the age of vinyl. The updated CD version of the box, Life's Like Poetry, came in 1992 and has since been out of print. It is only now that popular demand has been met with an updated version of the box. It has taken a lot of time, but it has also been done right. The title of the box is An Article for Life and it surely provides enough Frizzell music for a whole life. Lefty Frizzell was one of the founding fathers of modern country music, a great stylist, songwriter, interpreter and singer. His influence can be traced in names like Merle Haggard and Willie Nelson. As a tribute, Willie Nelson released his own version of "If You've Got the Money I've Got the Time" and he still stretches the pronunciation of time like Lefty did. Frizzell also stretched time in another sense. His music is timeless and transgresses generic bias. The box set is a fitting tribute to his career and it all started with "If You've Got the Money I've Got the Time." Track Listing: If You’ve Got the Money I’ve Got the Time. Personnel: Lefty Frizzell: vocal, guitar; Norman Stevens: lead guitar; Charley White: steel guitar; Homer “Bill” Callahan: string bass; R.L. “Pee Wee” Stewart: fiddle; Madge Suttee: piano.